Hector has rapidly intensified into a hurricane more than 2,000 miles east-southeast of Hawaii and could pass near the islands next week. Consolidated convection and a developing eye in a small inner core indicated that Hector was becoming better organized Thursday morning. Hector’s maximum sustained winds were 85 mph as of 8 a.m. PDT Thursday, an increase of 40 mph from the same time on Wednesday morning. Hector is expected to get pushed westward along the southern periphery of high pressure that will be moving westward in tandem, generally gaining strength over the next four to five days. 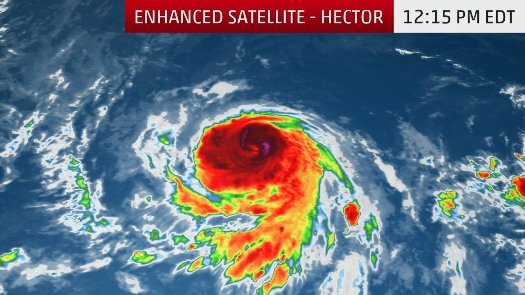 It’s possible that Hector could become a major hurricane (Category 3 or stronger) by this weekend. If Hector would continue its straight westward trajectory, it would track several hundred miles south of the Hawaiian island chain mid-late next week. But there’s one weather feature that could put a glitch in that forecast. Any weakness in the steering subtropical high to the north of Hector could allow it to creep on a slightly more northward path next week. The more north it tracks, the bigger direct threat Hector could pose to Hawaii next week. A few of our ensemble forecast model tracks are suggesting a more northward bend. It is too soon to determine how close Hector will track next week, and thus, what sort of impacts are going to occur. At least increased swells at particularly south and east-facing beaches are expected as soon as early next week, even if the system passes well to the south. A gentle transition toward El Niño has been in progression this summer. In the Atlantic Basin, this usually means less tropical activity, but the story is different in the Pacific. By definition, El Niño is warmer-than-average waters in the eastern or central Pacific, which is favorable for tropical systems. Years with El Niño usually have more tropical cyclones than in years with a La Niña or neutral conditions. Tropical systems like Hector feed on the ocean’s heat to build clouds, thunderstorms and wind. A trend toward El Niño means tropical systems that develop in the eastern and, sometimes, central Pacific Ocean will likely have more heat on which to feed in the coming months. In fact, the 80-degree line, which is used as a diffuse border between where tropical systems can develop and where they have a harder time intensifying, is farther north than normal to start August. This makes a considerable difference for systems moving from Central America westward toward Hawaii. Systems usually run out of warm water before they make it to Hawaii, but this year, a warm bridge of water is in place that might allow systems to make it farther west. Another piece of this climatological puzzle: Hector has formed in the favorable phase of the Madden-Julian Oscillation (MJO). The MJO enhances rainfall and supports tropical cyclones around the world when its enhanced phase of generally rising motion in the atmosphere comes around. Hector should benefit from this enhanced wave of the MJO for several days. This recent enhanced phase supported six tropical cyclones in the western Pacific, including Son-Tinh and Jongdari, and two more tropical cyclones in the eastern Pacific.